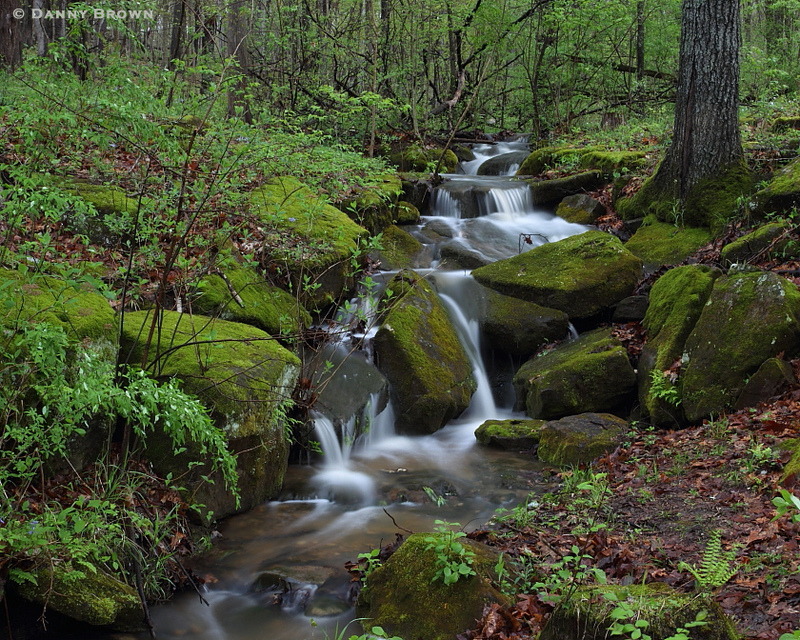 A wet-weather cascade reveals itself after an all-night storm over Shaw Nature Reserve in Franklin County. I’ve been watching this little wet-weather cascade for a couple of years during my hikes at Shaw Nature Reserve but I’ve never been able to catch it when both morning light and water flow were just right. I knew I might get my chance this morning following a rainy night over saturated soil. I decided to take that chance and as you can see from the featured image, I was well-rewarded. When I finally got a look at the falls, my worst fear, that the water would be muddy, was put to rest. I smiled at the sight of clear water winding its way through the moss-covered boulders, thanks to good watershed management by the staff at SNR. 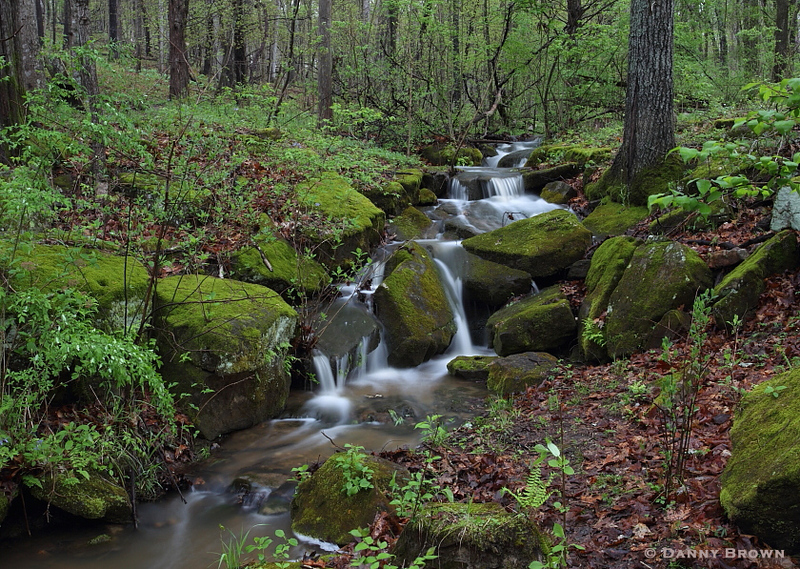 Due to a wet spring, the area was as verdant as it gets. All of the green, including the boulders themselves, made the place feel magical, especially as I stood there in the light rain at sunrise. A vertical look at the cascade. Even the boulders were green! The last shot of the morning, a little wider than the others. Later when I reviewed the images, I immediately began to nitpick about the surrounding brush and other distractions. 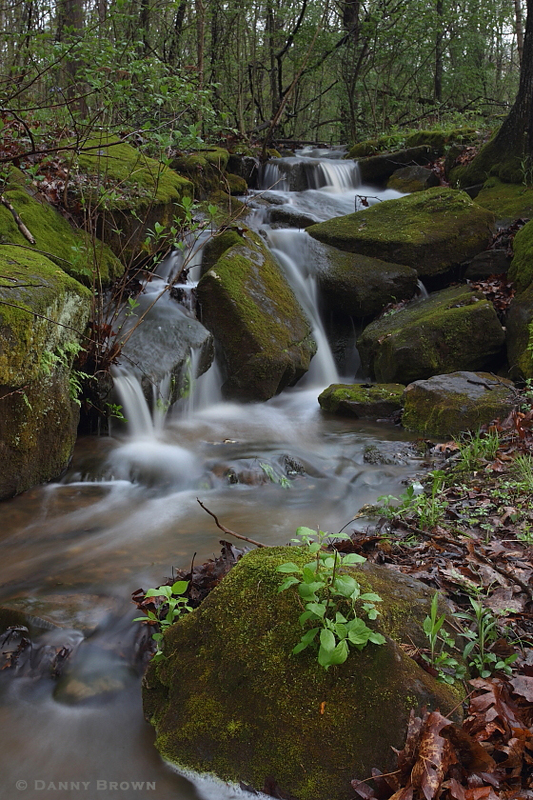 No, the little waterfall wasn’t the “perfect scene,” but it was nice enough to bring me some morning joy. Heck, if it were perfect I would have been standing there with 20 other photographers, all jockeying for the best position! Believe me, I know. I’ve been to Mesa Arch in Utah.